Scientists scouring the area around Stonehenge said last week that they had uncovered a circular structure only a few hundred yards from the world-famous monument. There’s some debate about what exactly has been found. The survey team that uncovered the structure said it could be the foundation for a circle of freestanding pieces of timber, a wooden version of Stonehenge. But Tim Darvill, a professor of archaeology at Bournemouth University in southern England, expressed skepticism, saying he believed it was more likely a barrow, or prehistoric tomb. 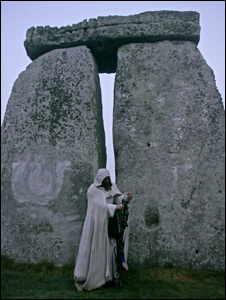 “In its day, Stonehenge was at the center of the largest ceremonial center in Europe,” he said. Although antiquarians have been poking around the area since the 18th Century, excavations are now tightly restricted. So archeologists have been scanning surrounding fields and pastures with magnetic and radar sensors that tractors or quad bikes pull across the grass. The new structure was found when scans identified a cluster of deep pits surrounded by a ring of smaller holes about 900 yards from Stonehenge and within sight of its famous standing stones. University of Birmingham archaeologist Henry Chapman said he was convinced the small holes were used to secure a circle of wooden poles that stood possibly 10 or more feet high. The timber henge — a name given to prehistoric monuments surrounded by a circular ditch — would have been constructed and modified at the same time as its more famous relative and probably had some allied ceremonial or religious function, Chapman said. Exactly what kind of ceremonies those were is unclear. The new henge joins a growing complex of tombs and mysterious Neolithic structures found across the area. Last year, researchers said they had found a small circle of stones on the banks of the nearby River Avon. 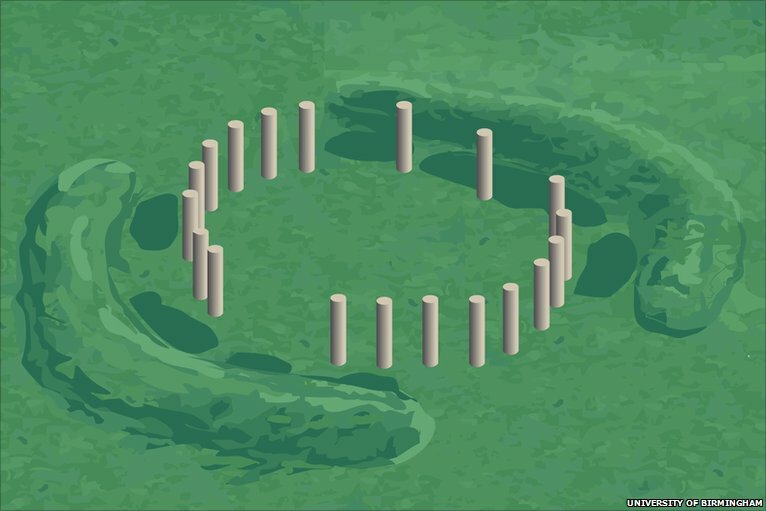 Experts speculated the stone circle — dubbed Bluehenge because it was built with bluestones — may have served as the starting point of a processional walk that began at the river and ended at Stonehenge. Chapman’s team is still in the early stages of its work, having surveyed only about 1 1/2 square miles of the 6 square miles it eventually plans to map. The University of Birmingham and the Austria-based Ludwig Boltzmann Institute for Archaeological Prospection and Virtual Archaeology are leading the survey, with support from other institutions and researchers from Germany, Norway and Sweden . Henges of various descriptions exist throughout Britain — from the Standing Stones o’ Stenness on the northern island of Orkney to the Maumbury Rings in the southern English county of Dorset. Stonehenge, a World Heritage Site, remains the best-known.